This article discusses formal requirements in open source software contributor copyright assignment and licensing agreements. Contributor agreements are contracts by which software developers transfer or license their work on behalf of an open source project. This is done for convenience and enforcement purposes, and usually takes the form of a formal contract. This work conducts a comparative analysis of how several jurisdicitons regard those agreements. We specifically look at the formal requirements across those countries to ascertain whether formalities are constitutive or probative. We then look at the consequences of the lack of formalities for the validity of those contributor agreements. © Andres Guadamuz and Andrew Rens 2013. Free and Open Source Software (FOSS) is a method of developing computer programs and releasing the resulting product under a licence that allows later modifications to the original code. Open source licences allow others to make their own modifications to the software and distribute them accordingly. It is understood that FOSS licences allow a wide range of freedoms for consumers that they would otherwise not have under full copyright protection (all rights reserved), such as making copies of the work, or installing and distributing the software. For all of the above to happen, access to the source code is necessary. FOSS relies entirely on source code; one could say that these written instructions are the currency of the information age, as the writing of these lines of code takes expertise and time. FOSS tends to be organised around projects in which a group of programmers come together to contribute code. These projects can take two forms: loose groups of programmers interested in sharing code for a common goal or interest, and more organised ventures with an established hierarchical structure. In both cases, the way in which individuals or groups contribute their work to the project is of the utmost importance. From the start, a FOSS project will have to decide what to do with the copyright of each individual contribution. This is what is covered by Contributor Agreements (CAs), which are written contracts in which the contributor either assigns copyright to the project organisers (that is, transfers the copyright to them), or grants them a license. CAs, therefore, can be drafted in two different ways: Copyright Assignment Agreements (CAA) and Copyright License Agreements (CLA). The CAA requires assignment, and therefore a transfer of copyright to the project owner, whereas the CLA requires an irrevocable license, which may be exclusive or non-exclusive, to allow the project owner to use the contribution. While an assignment is typically needed to give the project owner all necessary rights to legally enforce the project, copyright law in some jurisdictions may allow for a license but not for an assignment of copyright. To make things even more complicated, some jurisdictions require certain formalities for copyright assignments and/or (non)exclusive copyright licenses. Because CAs tend to be contractual in nature, it is imperative to look at contractual formalities in the formation of CAAs and CLAs. In this work we consider the implications for the validity of open source contributor agreements. This requires, in turn, a consideration of whether contributor agreements are purely contractual, or whether in some jurisdictions they represent a type of real or sui generis transaction, that is whether in legal theory there are two transactions, one an enforceable contract and the other a formal transaction. Furthermore, we ask whether copyright formalities are constitutive or probative. In other words, does a failure to comply with formalities completely invalidate the transaction or does it simply create evidentiary problems? A closely related question is whether a transaction that fails to transfer or licence copyright results in a contractual claim by the transferee to claim assignment or cession. In this article we address these issues and their implications for developing harmonized, open source contributor agreements. This work considers the laws of a number of jurisdictions from around the world. We conducted a high-level survey and received answers from a geographically significant sample of 16 jurisdictions; the survey asks specific questions regarding formalities in copyright agreements. This article summarises the results of the survey and attempts to analyse the relevance to CAs. Free and Open Source contributor agreements are agreements between an open source project and the contributors to the project which set out what the project can do with the copyright of the contribution: code, translation, documentation, artwork, etc. The purpose of such agreements is to make the terms under which contributions are submitted explicit and thereby protect the project, the users of the project’s code or content, and usually also the contributors themselves. Contributor agreements provide confidence that the guardian of a project’s output has the necessary rights over all contributions to allow for distribution of the product under, either, any license or any license that is compliant with specific principles. To put it in a nutshell, contributor agreements avoid, as far as possible, any future legal issues regarding the individual contributions such as disputes over origin, or ownership of rights over the code, or content of the product. While copyright assignment makes a lot of sense in a US-centric world, the growing internationalisation of software development means that assignment may not always be the best solution for a contributor agreement. For example, FOSS giant, Red Hat, conducted a survey with researchers at Georgia Tech to produce an Open Source Index, which measures the amount of FOSS currently present in a country, including factors such as existing open source and open standards policies, and the number of open source software users or producers. According to this Index, countries like France, Spain and Germany top the ratings. This serves as a clear indication that legal considerations regarding CAs should exhibit a more international perspective. Moreover, in the relatively short history of enforcement of FOSS licences most cases have tended to take place outside of the US, with Germany having been the jurisdiction of most of the cases until the time of writing. The above might explain why not all FOSS projects favour assignment of copyright. The Free Software Foundation Europe (FSFE) has in place a specific exclusive license agreement called the Fiduciary Licence Agreement (FLA) for those cases in which assignment of copyright is not possible. Other projects and companies favour non-exclusive licensing or rights, as is the case with PERL and Google. Finally, there are some forms of contributor agreements that use neither assignment nor exclusive/non-exclusive licences. These are projects that simply require of contributors that they should licence their own code using a specific license. The most prominent example of this approach can be found in the Mozilla Foundation’s Committer Agreement, which specifies that all code committed by the user should be made available under the terms of the Mozilla Public License. Because this is a broad and open development license, this elegant approach mostly bypasses all questions about contract formation and formalities that can be asked with regards to CAAs and CLAs, as the project will simply use the code under the terms of the suggested licence in which the contributor allows the users to “use, reproduce, make available, modify, display, perform, distribute, and otherwise exploit” the contributed code. Most legal practitioners would regard it is as simple legal prudence to record contributor agreements in text, and to demonstrate the consent of the contributor. However many jurisdictions require more than that, insisting on formalities of signature and writing. Formalities of signature and writing are significant for Open Source Contributor Agreements because many copyright statutes require that complete transfers of copyright must be in writing. A significant number of jurisdictions also require that the assignor sign the document, often referred to as a deed, in which the cession of rights is recorded. Many jurisdictions also require that some types of license be recorded in writing. While a fixed text and demonstration of consent are relatively easily achieved in the online environment, thus fulfiffling the purpose of formalities, the specific requirements of statutory requirements were crafted for a world of paper documents and are often ill suited for the online world. While the substantive aspects of copyright law are relatively compatible across the world thanks to the harmonizing effect of international treaties, formalities for copyright agreements tend to be considerably less uniform. The definition of what constitutes writing and signature is often not set out in copyright statutes themselves but contained in other laws on evidence, contractual formalities, electronic commerce, and sometimes case law on copyright statutes. Some countries have tried to adapt requirements of writing and signature to the digital environment and have created definitions of writing and signature to this end. The consequence is that different jurisdictions treat these formalities differently. When one looks at some of the most-used licences, and at some popular projects, it becomes evident that the majority of contributory agreements favour a strict formal approach, requiring an agreement in writing and signed in physical form. This is because the agreements are treated as contracts between the contributor and the project, and there is an assumption that contracts must comply with all of the necessary formalities. For example, the Free Software Foundation requires that the assignment contract should be printed, signed, and then it should be “snailed” to the project coordinator at the FSF. Similarly, many other projects require an “original” signed copy of the contract to be sent to the project’s headquarters, be it an assignment or a license. For example, Google’s Individual Contributor License Agreement and PERL’s Contributor License Agreement, both require signed original forms to be mailed back to the project administrators. There are a few exceptions to this rule. Apache’s CLA requires signature, but allows files to be scanned and emailed. As will be discussed in later sections, electronic signatures are accepted for the fulfilment of contractual formalities in a large number of jurisdictions, and therefore it is surprising that there are not more projects that favour electronic contract submission. Perhaps there is a culture of risk aversion on the part of developers and project administrators, but the assumption that contracts can only be concluded by means of a physical signature does not have any legal standing. Finally, Harmony Agreements is worthy of mention as a site that offers both options on formalities. This is a project that creates standardized contributor agreements on demand via an electronic submission form. This is complementary to the widely used open content licensing frameworks that provides an “easy-to-use” way to utilize contributions in the first place. Developers can choose from a variety of options, including licensing, and they can also choose which type of formalities will be used in the conclusion of the contributor agreement, be it by mail, email, fax, or electronic submission form. It is important here to separate the subject matter of contributor agreements from formalities. While the agreements are dealing with the subject matter of copyright, be it the transfer or the grant of such rights, the actual CAs are contractual in nature. While some copyright statutes deal with the nature of contracts, or other legal instruments, that transfer rights, contract law will govern many of the specifics regarding the agreement. Having said that, the “enjoyment and exercise” of copyright is devoid of formalities in accordance with Art 5.1 of the Berne Convention for the Protection of Literary and Artistic Works. This means that the subsistence of copyright does not rest on compliance with formal requirements; rights will exist as long as the work meets the requirements for protection set out by national law and treaties. To paraphrase a famous copyright saying, copyright flows from the nib to the pen, or from the fingers to the keyboard. While there is no constitutive formal requirement in copyright law, some jurisdictions necessitate some sort of registration in order to be able to enforce rights, as is the case with the United States, as already mentioned. This lack of harmonization with regards to something as simple as registration can prove problematic when it comes to international instruments such as contributor agreements. This is a point made by some scholars when discussing the topic of the lack of international norms dealing with formal requirements. Rochelle Dreyfus for example has commented that various substantive IP agreements such as the Berne convention, or the Agreement on Trade Related Aspects of Intellectual Property Rights (TRIPS), have advanced international harmonisation in many issues, but that they do not deal with any important procedural topics that are very important for litigation purposes, such as contract formation, licensing, jurisdiction and choice of law. Nonetheless, the actual CAs, be they assignment or licensing agreements, are clearly contractual in nature, so copyright law should only be useful if it specifically has something to say about these types of contracts, as is the case in many jurisdictions that will be discussed later. There is an argument to be made that FOSS licenses are not contracts in some jurisdictions. While these arguments are interesting in themselves, the contractual nature of the CAs can be gleaned from various issues, such as the fact that in some cases the agreements state so unequivocally (e.g. the aforementioned FSF contributor assignment agreement), and also because we are presented with traditional contractual formation situations in which both parties have a meeting of minds. While the CAs are contractual in nature, it must be remembered that the licences themselves, and therefore the subject matter, still rests upon copyright issues and claims. This dichotomy was explored in the landmark US case of Jacobsen v Katzer. The case involved Robert Jacobsen, an open source developer participating in an open source project called Java Model Railroad Interface (JMRI), which is a computer program for model trains released under the Artistic License. Jacobsen received a letter demanding license fee payments from a company named Kamind Associates, owned by Matthew Katzer, which had previously obtained software patents over model railroad software. Jacobsen decided to pre-empt legal action and sued Katzer first, alleging that the patent was invalid on the grounds of obviousness, and for failure to meet disclosure requirements. He later amended the complaint to include copyright infringement, as he claimed that his software pre-dated Katzer’s. By siding with Jacobsen, the CAFC made a strong statement in favour of open licences in general, and of the copyright elements contained therein. While this is not completely relevant for CAAs, which are contractual, it does streghten their subject matter. One of the most important issues to be considered when studying CAs is precisely the jurisdiction and choice of law that will govern the agreement, as there will be a considerable disparity between contractual and copyright approaches to formalities from one jurisdiction to the other, as will be explained in following sections. The lack of harmonisation in this regard can have some important implications because they may impact on the possible validity of open source contributor agreements. For example, imagine a contributor who contributes to a project based in a country that allows assignment, but lives in a jurisdiction which does not allow copyright assignment. Which law would apply? Would the agreement be invalid? Imagine another situation in which an open source contributor agreement is to be executed in a jurisdiction that does not require some formalities that do exist in the jurisdiction where one of the parties are domiciled, e.g. one country requires writing for exclusive licenses, while the other one does not. “(1) Regarding the succession of rights in this contractual relationship, German law shall apply, unless this Agreement imposes deviating regulations. In case of the Beneficiary’s death, the assignment of exclusive rights shall continue with the heirs. In case of more than one heir, all heirs have to exercise their rights through a common authorized person. Clauses like these are to be encouraged, but unfortunately they are not always present in some of the most important contributor agreements, such as the FSF and Apache CAAs mentioned above. In the absence of such clauses, the rules of Private International Law will apply. It is not the remit of this work to give a detailed description of the topic of international jurisdiction, so just a quick look at some widely accepted rules will suffice for now. The rules on choice of law prevalent in the European Union tend to be typical of the international trends when dealing with copyright licenses and CAs. The Rome Regulation 593/2008 (Rome I Regulation), is the prevalent norm dealing with applicable law in the absence of choice of law clauses in the EU. The courts of the Member States are always obliged to apply this Regulation, to a dispute before them even if none of the parties resides in a Member State, or if the law applicable in accordance with the provisions of the Convention is that of a third State. According to the Rome I Regulation, in the absence of a choice of law clause, the law is of the country where the seller or the provider of services have their residence. If the contract is not for either of those, or for any of the other cases specified, then the contract “shall be governed by the law of the country where the party required to effect the characteristic performance of the contract has his habitual residence.” If the circumsntances of the case make it clear that a contract is more closely connected to another country other than the place of habitual residence contemplated above, then the law of that country shall apply. If the applicable law cannot be determined from any of the above, then “the contract shall be governed by the law of the country with which it is most closely connected”. in the case of unilateral acts, the law of the country where the act was done, or where the person who did it has its habitual residence. So, in light of the Rome I Regulation, let us look at the two hypothetical cases posed above. It would be fair to say that in the absence of a choice of law clause in a CA, the most likely answer is that the applicable law would be that of the country where the project is based, as this would be the jurisdiction to which the contract would be more closely connected because the party that is supposed to perform the terms of the contract is domiciled there. It must be stressed again that these are rules that apply in the EU only, but they tend to be commonly accepted principles for choice of law. However, as it has been repeatedly pointed out, this is an area that lacks international standardisation. In order to analyse the international approach to formalities in copyright assignment and licensing, we created an open online survey. The questionaire was designed by the authors trying to get the most thorough overview of the state of formalities in each country. We targetted legal experts from around the world who are working in the area of open licensing, particularly using existing channels of communication from the open source legal community, and the Creative Commons legal leads. The fact that we were asking well-known international experts, as well as the fact that we asked for legal citations where possible, gave us confidence about the quality of the replies. This allowed us to be able to conduct an analysis with peace of mind about the quality of sources. Assignment and License: These questions deal with the issue of whether assignment and exclusive licenses are accepted in the responding jurisdiction. Assignment Formalities: This section deals specifically with the formalities required by the transfer of copyright, if it is allowed by law. License Formalities: This section asks for the formalities in exclusive licenses and sub-licenses. Technical Signature: This asks whether electronic and digital signatures can be used to satisfy formal requirements in copyright transactions. Writing: This asks for possible definitions of what constitutes writing, if this is a formal requirement in the responding jurisdiction. Effect of lack of formalities: This section asks the effect of lack of formalities, whether it invalidates the CA, and poses several scenarios after a possible declaration of invalidity. For those unfamiliar with software copyright issues, it might be worthwhile to clarify a point regarding moral rights. When asking questions about assignment of rights, we are always referring to economic rights, and not to moral rights. The reason for this is twofold. Firstly, most of the jurisdictions studied in our report are from civil countries, where moral rights are inalienable, so it makes little sense to analyse rights that cannot be transferred, waived or licensed. Secondly, moral rights generally do not cover software, or cover it in a limited way, so they are outside of the scope of the study. Chile: Copyright ownership can be assigned, and exclusive licenses can be granted. There are writing formalities required for assignment, the contract must be notarized (there is no indication however if notarization can be electronic). Assignment can be concluded through electronic signature. Assignments that do not meet the required formalities can be declared void at the request of a party. Voided assignments almost never have any effect on third parties, but there may be exceptions with regards to promises in deed (promesas escrituradas). China Mainland: Assignment and exclusive licensing are possible, but with formalities, although this is not stipulated clearly in the law, so it is mostly a question of legal practice. Technical signatures are allowed for the fulfillment of formalities. Failure to comply with formalities renders copyright assignments or licenses completely void. Colombia: Assignment of copyright is possible, requires writing, and the document has to be registered in the National Copyright Registry. Assignment can be performed using electronic signatures. The assignment is completely void in the absence of a formal requirement. While the act is completely void, bona fide third parties may be able to try to enforce acquired rights. Costa Rica: Copyright assignment is possible if it is recorded in a public or private document, before two witnesses, with no registration required. Technical signatures can be used for assignment. An assignment contract is invalid in the absence of formalities, and while it is completely void, it has to be declared as such by a court of law. The voided act has no effect whatsoever, even against third parties. France: Copyright ownership can be assigned, and exclusive licenses can be granted. These are performed only by written deed between the assignor and assignee. As is the case in all European countries, technical signatures can be used in assignment contracts. Failure to comply with formalities renders copyright assignments or licenses void at instance of either party. Germany: Copyright cannot be assigned, but an exclusive license can be granted. Formalities are not required for licensing that requires sub-licensing. Technical signatures are accepted for the purpose of copyright formalities. Acts that require formalities are completely void in the absence of constitutive formalities. Guatemala: Copyright cannot be assigned, but it can be granted by exclusive license. It is not clear if sub-licensing or exclusive licenses require formalities, but technical signatures are accepted to fulfill formalities. HongKong SAR: Copyright ownership can be assigned, and exclusive licenses can be granted. The assignment must be signed and in writing. Technical signatures are accepted for the purpose of copyright formalities. If formalities are not complied with the transaction may be difficult to prove, so an agreement might still be technically valid. A proven absence of a formality will have the effect of voiding that particular act, but the failed transaction will still have effects for those with equitable interest in the transaction. Italy: Copyright can be assigned and exclusively licensed. Formalities are required for both acts. The transfer or exclusive license needs to be in writing, but this requirement is probative and not constitutive. There appears to be no signature requirement, but technical signatures are accepted for copyright purposes. The failure to comply with formal requirements is difficult to prove, so the act will still be technically valid. Japan: Copyright ownership can be assigned, and there are no formalities required for assignment or exclusive license. The Netherlands: Copyright can be transferred and exclusive licenses granted. Assignment requires formalities, while exclusive license does not. The formality required for assignment is a deed, which is a written and signed document. Technical signatures are allowed, but these are not defined. The effect of lack of formality is that the contract is void at instance of either party. Portugal: The law distinguishes between partial and total transfer, both requiring formalities. A partial transfer requires a document in writing, notarized signature, and registration. A total transfer requires a public deed and registration. Technical signatures are not accepted for the purpose of copyright formalities. The absence of a formal requirement makes the act completely void. South Africa: Copyright ownership can be assigned, and exclusive licenses can be granted. Both assignment and exclusive license require signature and reduction to writing. Technical signatures are allowed to fulfill the signature requirement of copyright formalities, while digital form meets the writing requirement. An absence of formal requirements renders the assignment completely void, but bona fide third parties may in principle have acquired rights, and can raise estoppel. Taiwan: Copyright ownership can be assigned, and exclusive licenses can be granted; no formalities required for either. USA: Copyright assignment must be signed and in writing, as must exclusive licenses that give the right to grant sub-licenses. Non-exclusive licenses do not require any formalities. Technical signatures are accepted in order to fulfill signature formalities. Acts lacking formalities are completely void, although third parties may be able to acquire some rights. United Kingdom (England): An assignment of copyright is not effective unless it is in writing signed by or on behalf of the assignor. Writing is defined to include electronic means of displaying information, and electronic signatures are allowed to sign assignment. The effect of lack of formal requirements is that the contract has no contractual effect, and it is to be treated as a declaration of intent. This means that it may have effects for bona fide third parties. From the submitted answers to the questions posed in the survey discussed above, it is clear that the vast majority of respondent jurisdictions allow for the assignment of copyright, with the exception of Germany and Guatemala. In contrast, all countries allowed both exclusive copyright licenses, and the subsequent relicensing of copyright by a licensee. This would strongly indicate that, if the goal is to make contributor agreements more international, then exclusive licenses may be favoured instead of the current general practice of assignment of copyright. Of course, there are other considerations at stake, but exclusive licensing gives better international coverage for the agreements. When assignment is allowed, most of the respondent jurisdictions required some form of formality for the assignment to be valid. This invariably takes the shape of signature and written requirements of some sort in the shape of a deed, with only a few jurisdictions requiring also some sort of registration. There is one case worthy of mention, and that is South Africa. While its copyright legislation clearly requires formalities for both assignment and exclusive licensing much in line with most of the other responding countries, an exceptional case and its sequel suggest the imposition of requirements beyond form. Because capital exports require permission from financial authorities, namely the Reserve Bank of South Africa, copyright assignments to non South African persons result in the annoying situation that on top of the formal requirements of signature and writing, they also have to be authorised by the Reserve Bank. Although the second highest court of appeal ruled that intellectual property is not ‘capital’ subject to exchange control regulation, the subordinate legislation was subsequently amended to specifically include intellectual property as capital. As a result, transfers require signature from financial authorities, but thankfully this requirement can be performed post-facto and therefore does not invalidate an assignment. It is worthy of note that Colombia is a country in which the formalities and registration apply similarly to partial transfers and exclusive licenses, making it indistinguishable to choose one or the other from the perspective of ease of transfer to the project administrators. Another comparative advantage in favour of exclusive licensing over assignment might emerge when we compare the formalities required for the former. Of the 16 jurisdictions examined, only 6 require formalities for exclusive licences, 5 do not, and 5 did not respond, or the situation is not entirely clear. Taken into consideration all of the above elements, there is a strong indication that while formalities are required for the complete transfer of copyright, there may be fewer or laxer formalities for exclusive licenses, although the sample is not overwhelmingly devoid of formalities for those kinds of documents. From the previous section it is clear that copyright transfers must be made in writing and signed by the owner in order to be valid. As has been stated in previous sections, CAs tend to require original written and signed documents in the case of copyright assignment. However, this practice is at odds to what we found. According to the responses to our survey, all of the jurisdictions studied allowed digital or electronic signatures for the purposes of copyright formalities (See Table 1). In the survey, we used the very broad definition of technical signature. Most of the literature on the subject tends to refer to electronic signatures, which can be any sort of technical information used for identification purposes, while the term digital signature is used to describe specifically those authentication mechanisms that employ encryption. These technology neutral definitions allow any sort of representation of words in a visible form. Case law has been adopting this broad definition, and therefore many electronic forms of display are accepted as evidence whenever the law requires written documents. The admittance of electronic formats goes beyond the mere recognition of displayed information, electronic documents will be admitted in court even if they require some form of translation. For example, in the Scottish case of Rollo v HM Advocate, police found evidence on a handheld device called a Memomaster, and the court accepted that it constituted a ‘document’ even though the information required to be processed by decoding the information contained in the device by means of electronic translation. “Art. 3. Any communication of a representative or declarative nature, expressed or transmitted by electronic means, will be legally equivalent to documents that are granted, reside or are transmitted by physical means. The result is that both electronic documents and electronic signatures can be used for the successful construction and conclusion of copyright acts, be they assignment or exclusive licensing agreements. Our survey found that this is the case in most jurisdictions, and while some did not have definitions of writing, it seems clear that the prevailing trend is that technical signatures and documents are sufficient for the conclusion of copyright agreements. It would be fair to say that there is no legal impediment to contributor agreements being conducted by electronic means. The results were interesting. 46% of the responding jurisdictions considered that lack of formalities would result in the agreement being completely void, while 27% would consider the agreement to be void only at instance of one party, while 27% found it difficult to prove but still technically valid (see Figure 1). These results indicate that in almost three quarters of the surveyed jurisdictions the consequence of lack of formality might be voidness of the contributor agreement, either being completely void, or to have it declared at instance of one of the parties. There is therefore a great incentive to comply with any formal requirements. Furthermore, several jurisdictions declared that formalities are constitutive (e.g. China Mainland and Chile), and therefore any lack of formalities would mean that either the assignment or the license is not yet established, let alone valid. 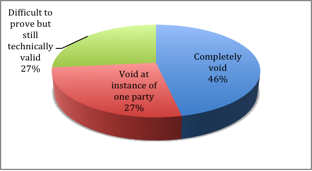 If the agreement was to be found to be invalid, we asked in the survey for several possible scenarios that may benefit thirds parties, or which may allow some clauses to survive the declaration of voidness by the lack of formalities. It seems like those jurisdictions where the agreement would be technically valid due to the difficulty of proving a void agreement were more likely to allow more leeway for contracts lacking formalities, which is to be expected. For example, Hong Kong is a jurisdiction where the agreement would still be technically valid. If the formalities of an assignment or a license were not followed, then the rights being assigned would not be transferred. However, depending on the circumstances, it might still be possible to imply an equitable interest in favour of the assignee. Without a written document signed by the assignor, it would certainly be more difficult to prove the intention of the parties or the existence of the assignment. Nonetheless, our respondents opined that prevalent case law supports the view that if the circumstances point to a meeting of minds to assign the rights, it might still be possible for the courts to rule in favour of the existence of an equitable interest in favour of the assignee. Similarly, we asked our respondents if some provisions may survive a void contract, e.g. warranties implied by law. In those jurisdictions where the voidness has to be declared at instance of one of the parties, the answer seemed to be that some provisions might survive the declaration, as was the case with Guatemala. In jurisdictions where the contract is to be considered completely void, such as in Chile, there was no possibility for any provision to survive, as the lack of formalities translates into a lack of contractual obligations, regardless of existing implied waranties. We then asked if bona fide third parties could use some legal claim, such as estoppel, against copyright holders. The answers were mostly negative. Respondents in jurisdictions where the contract is completely void answered no, as the act has no legal effects even in cases of good faith. As estoppel is a common law figure, most jurisdictions answered negatively on estoppel, as such claims do not exist in those jurisdictions. Surprisingly, respondents even in common law countries such as the US and the UK were reluctant to answer positively, as estoppel is very fact-specific, and therefore to raise it as a defense would depend on the actual case; the exception to this was found in South Africa, where case law has allowed the raising of estoppel to provide relief for third parties although not yet specifically in respect of copyright. Another noteworthy exception was China Mainland. While there is no estoppel there, the figure itself is reflected by the principle of honesty and credibility. Based on these principles, the interests of parties exhibiting good faith are protected. So in countries that have similar provisions as in China Mainland, it may be possible for a bona fide 3rd party licensee to raise a claim for compensation from copyright holders. – 1. In terms of formal requirements, a juridical act shall be valid if it meets the formal requirements of the foreign law that is applicable to the juridical act itself or of the law of the State where the juridical act is performed. So in theory it seems as though an act that is valid in the country where it is to be performed should be valid in the Netherlands, but the above does not answer the question of whether a court that had found the act invalid in the Netherlands would still consider it valid in another jurisdiction. It is possible that we simply asked the wrong question, as the Dutch Civil Code points towards the fact that the court would have found the contract valid in the first place if the formalities were met in the jurisdiction where the act is to be performed. We then asked if a court would consider choice of law before formal validity questions. Again, we seem to have encountered a grey area of the law. The response from the United States is typical of the ambiguities present in legislation and case law across the board in this regard. In the US an oral agreement to assign an exclusive right under copyright is a valid contract under state contract law. However, the contract cannot be enforced because Federal Law is supreme and enforcement of the transfer would contravene copyright law, which declares that a transfer of copyright requires formalities of writing and signature. But, the agreement would still be valid as a contract for other purposes. Therefore, a court could theoretically decide on a choice of law provision of an oral agreement before deciding whether it conforms with formalities set out in copyright law. To summarise, the more detailed the questions, the less harmonious replies we obtained. Free and Open Source Software relies heavily on the contributions of computer code made by both individuals and institutions. Contributor agreements are a way to make those donations structured and systematic, allowing peace of mind to the author and the recipient FOSS project. As contributions become more international, a comparative analysis of the laws governing such agreements is long overdue. It has been the goal of this work to shed some light on some of the most important issues surrounding CAs. By conducting a survey encompassing a representative number of jurisdictions, we are hoping to enrich the literature on the subject, and to help future FOSS contributors and project managers to make more informed decisions about assignment and licensing of copyright in open source software. We found that while most countries allow assignment of copyright, there are some important exceptions that may prompt developers to choose other solutions. All of the jurisdictions surveyed allowed both exclusive and non-exclusive licensing of copyright, so it can be easily argued that this is the best solution for contributor agreements. Moreover, while the number of jurisdictions that require formalities for exclusive licenses remains high, the fact that some jurisdictions do not require formalities for such licenses also makes exclusive licensing a more logical choice. Assignment is however sometimes necessary for enforcement, so developers should consider whether the transaction costs of assignment (and its impossibility in several jurisdictions) do not weigh against obtaining the ability to enforce copyright on a contribution until litigation is actually contemplated. Whichever type of agreement is chosen, our study made clear that one thing has to change immediately across the board. We found that all jurisdictions surveyed allowed contracts to be concluded by electronic means by allowing electronic signatures, and by having broad definitions for written requirements. While it is understandable that counsel for some prominent projects has decided to be conservative and request that CAs should be concluded with original signed copies, there really is no reason to maintain this practice. On the contrary, we recommend that projects make contributions easier by allowing the transfer or licensing through electronic forms. In that respect, easy-to-use interfaces such as Harmony Agreements are the way of the future. While we can see trends emerging, it is evident that the lack of international harmonisation with regards to contract formation is something which the international community could work on. The inclusion of procedural and enforcement provisions in international copyright agreements would go a long way towards ameliorating some of the grey areas that we encountered with our survey. There is scope to follow-up on this survey with future research. We hope to continue monitoring the developments in the field of contributor agreements, but we also believe that the findings of this work may have implications to wider IP licensing scholarship and practice. A work detailing these findings for a broader audience is therefore definitely warranted. Technical signature is the term we use to refer to digital or electronic signatures or the like. Since digital and electronic signatures may refer to different types of signature even in the same jurisdiction we use the term technical signature to include all technologically enabled signatures. Digital data is the term we are using to refer to writing stored by a computer. Where in the law are the consequences of failure to comply with the formalities set out? If available, please give full legal citation, relevant legal source and an English re-translation if necessary. Could the putative recipient of the copyright work or copyright license require the putative transferor to complete a valid transfer or license under a contractual or similar claim? Could a bona fide 3rd party licensee raise estoppel against copyright holders? Could some provisions e.g. warranties implied by law survive a finding of voidness for non-compliance with formalities? Could the agreement be regarded as valid in respect of transferring or licensing copyright in other jurisdictions by a court that has found it to be an invalid transfer or license in its own jurisdiction? Would a court consider the validity of an agreement based in its compliance with copyright formalities before considering choice of law provisions in the agreement? Are there any other provisions in your jurisdiction that affect contributor agreements or do you have additional comments? * Senior Lecturer in Intellectual Property Law, University of Sussex. The source code is the written instructions that execute instructions. For more on the topic, see: A Guadamuz, “Open Source Software”, In L Edwards and C Waelde (eds), Law and the Internet, 3rd Ed (2009). A Hars and S Ou, “Working for free? Motivations of participating in open source projects”, Proceedings of the 34th Annual Hawaii International Conference on System Sciences (2001). RA Ghosh, CODE: Collaborative Ownership and the Digital Economy, (2005). For a more detailed discussion of CAs, see the accompanying pieces in this special issue. US Copyright Office, Copyright Basics, http://www.copyright.gov/circs/circ1.pdf. E Moglen, Why the FSF gets copyright assignments from contributors (2013), http://www.gnu.org/licenses/why-assign.en.html. Apache Foundation, Individual Contributor License Agreement v2, http://www.apache.org/licenses/icla.txt. See Guadamuz, supra note . For example, PERL, see their Contributor License Agreement: http://www.perlfoundation.org/contributor_license_agreement. Mozilla Public License 2.0, http://www.mozilla.org/MPL/2.0/. Mozilla Public License, s 2.1(a). See Section 5 for more detail about specific jurisdictions. Namely the Free Software Foundation, Apache, MIT and Mozilla. For a list of the top 10 licenses, see: http://osrc.blackducksoftware.com/data/licenses/. Snail mail, a term used to describe traditional physical mail. These are material form, originality and made by a qualified person or in qualified jurisdiction, WR Cornish and D Llewelyn, Intellectual Property: Patents, Copyright, Trade Marks & Allied Rights, 7th ed (2010). R C Dreyfuss, “An Alert to the Intellectual Property Bar: The Hague Judgments Convention,” 2001 University of Illinois Law Review 421 (2001). For a more detailed discussion about that subject, see: A Guadamuz, “The License/Contract Dichotomy in Open Licenses: A Comparative Analysis” (2009) 30 University of La Verne Law Review 2 101. For some works dealing with this subject, see: U Kohl, Jurisdiction and the Internet: A Study of Regulatory Competence Over Online Activity, (2007); H Steinberger, “Sovereignty” in R Bernhardt (ed), Encyclopedia of Public International Law (1987); D L Burk, “Jurisdiction in a World Without Borders” (1997) 1:3 Virginia Journal of Law and Technology 1522; and M Hayashi, “The Rules of Jurisdiction in Public International Law”, In M Dunn, S F Krishna-Hensel, V Mauer (eds) The Resurgence of the State: Trends and Processes in Cyberspace Governance (2007). For a more detailed description of this topic, see the accompanying piece by Axel Metzger. Regulation (EC) No 593/2008 of the European Parliament and of the Council of 17 June 2008 on the law applicable to contractual obligations (Rome I). Because each jurisdiction tends to use the terms ‘electronic signature’ and ‘digital signature’ differently we used the term ‘technical signature’ to designate any action that utilises Information and Communications Technology and is recognised as a signature in a law. For a full list of questions, see Appendix A.
 H Hansmann and M Santilli, “Authors’ and Artists’ Moral Rights: A Comparative Legal and Economic Analysis” (1997) 26 The Journal of Legal Studies 1 50. For example, computer programs are excluded from moral right protection in the UK, see s79 of the Copyright, Designs and Patents Act 1988. The full text of the responses will be made available online at the following URL: http://harmonyagreements.org/. See the accompanying piece by Tim Englehardt on the subject of assignment versus licensing. Hong Kong SAR Copyright Ordnance (Cap 528). United States, Title 17, U.S. Code. Oilwell (Pty) Ltd v Protec International Ltd and Others  ZASCA 29, 2011 (4) SA 394 (SCA) the court found that intellectual property is not ‘capital’ within the meaning of the term in terms of the South African exchange control regulations; the regulations were subsequently amended to reverse the effect of this ruling. Namely s4 of the South African Exchange Control Regulations 1961. Colombia, Ley 23 de 1982, as modified by Ley 1450 de 2011. China Mainland, Copyright Law of the People’s Republic of China 1991. Portugal, Código do Direito de Autor e dos Direitos Conexos. S E Blythe, “Digital Signature Law of the United Nations, European Union, United Kingdom and Untied States: Promotion of Growth in E-Commerce with Enhanced Security” 11 Richmond Journal of Law and Technology 1 (2004-2005). M Hogg, “Secrecy and Signatures – Turning the Legal Spotlight on Encryption and Electronic Signatures”, In Edwards and Waelde (eds), Law and the Internet: A Framework for Electronic Commerce, (2000), pp.37-54. Costa Rica, Ley Nº 8454 de Certificados, Firmas Digitales y Documentos Electrónicos. Directive 1999/93/EC of the European Parliament and of the Council of 13 December 1999 on a Community framework for electronic signatures, L 013/2000/12. Italy, Arts. 1 q-s Codice dell’amministrazione digitale, Decreto Legislativo 7 marzo 2005, n. 82. South Africa, Art 1, Copyright Act 98 of 1978. UK, Schedule 1 of the Interpretation Act 1978. Rollo v HMA 1997 JC 23. Directive 2000/31/EC of the European Parliament and of the Council of 8 June 2000 on certain legal aspects of information society services, in particular electronic commerce, in the Internal Market, L178/2000/1. Estoppel is a rule prevalent is common law jurisdictions whereby a person is barred from denying the truth of a fact that has already been settled. See: R C Dreyfuss, “Dethroning Lear: Licensee Estoppel and the Incentive to Innovate”, (1986) 72:4 Virginia Law Review 677. United Stated, 17 U.S. Code §204.